Although a certain sense of sadness is inevitable, we feel it is nevertheless far more a time to celebrate the remarkable life and accomplishments of someone who was truly a figure of global and by no means merely British or European influence and, by common consent, one of the greatest ever British Prime Ministers. Although every person has their flaws and not all her views would reflect UPF values, Lady Thatcher was a great champion of freedom around the world, both through her tireless opposition to Soviet-backed communism and to tyranny in all its forms. Also her insistence on the importance of the responsibility of the individual as the basis for building a free, just and prosperous society, values that UPF very much shares and seeks to realise in all that it does. What was not commonly known to most, was that Lady Thatcher held UPF's Founder Reverend Moon and many projects and activities of his in high regard. There is no doubt that she felt a profound empathy and respect towards him based on his tireless devotion to exposing the wrongs of global communism and in promoting the core values of "Family, Faith and Freedom". That empathy was strengthened by her own often deeply painful experience of working desperately to change things for the good of all and finding that all kind of negative forces came against her and that she was vilified for her efforts. This, as she surely realised, was a recurring theme in both of their lives! In 2007, on the 25th anniversary of The Washington Times (also founded by Rev Moon) she sent a touching DVD tribute to be shown to the highly distinguished audience at the celebration in that city. This included, among many others, the 41st U.S. President, George H.W. Bush. 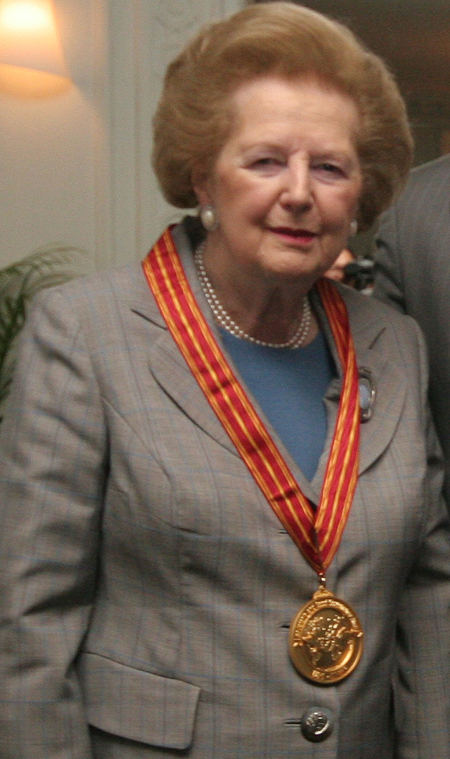 In it she acknowledged the newspaper's important role in combating global communism, a contribution that had moved President Ronald Reagan to credit the paper on the occasion of its 10th anniversary in 1992 by saying "Oh yes and together we won the cold war". She also lauded the newspaper's core journalistic and other values. 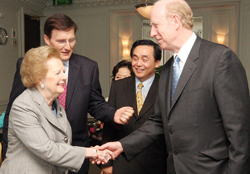 In 2008 Lady Thatcher was proud and visibly moved to receive UPF's Leadership and Good Governance Award, one instigated by Reverend and Mrs Moon themselves and received by many other prominent world leaders over the years. She can be seen below holding the citation and wearing the accompanying gold medal of honour and in the presence of our International President Dr Thomas Walsh, seen here being introduced to Lady Thatcher by European Secretary-General, Mr Mark Brann at the award ceremony in London. She expressed herself as being always willing to help. "If ever you need me, just give me a call" she said with real feeling. And she was always as good as her word. Thus in 2010, being informed of Reverend Moon's 90th birthday celebrations she insisted on herself writing a special birthday greeting letter addressed to Reverend Moon in her own hand and to be read out at the celebrations in Korea and expressing the hope that it would be a "splendid occasion". She did so without regard to whether this might provoke criticism of her from those hostile to him. Needless to say, it was extremely well received in Korea! Baroness Thatcher will be deeply missed by many but there can be no doubt that her legacy will live on for generations and be an important part of the world of lasting peace that UPF is committed to help build! The Leadership and Good Governance Award is presented by the Universal Peace Federation to people manifesting standards of excellence in leadership, integrating professional expertise and practical wisdom with moral and spiritual principles. Candidates from all fields and realms of governance are considered, including leaders from religion, government, non-governmental organizations, corporations, and educational institutions. Recipients include current and former heads of state and government, parliamentarians, and significant religious leaders throughout the world.